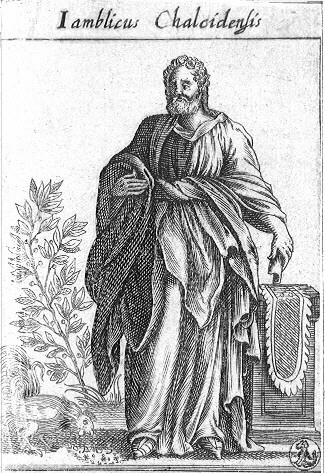 Iamblichus (250-325 A.D.) is the third most important Neoplatonic philosopher, after Plotinus and Proclus. He was a student of Plotinus' disciple Porphyry. His most influential treatise is entitled On the Mysteries of the Egyptians, which deals with a 'higher magic' which operates through the agency of the gods. The Renaissance alchemist, Heinrich Cornelius Agrippa (1486-1535) refers frequently to Iamblichus in his De Occulta Philosophia. Iamblichus also had a strong influence on the Renaissance Neoplatonists Marsilio Ficino, Pico della Mirandola and Giordano Bruno. Iamblichus is also explicitly mentioned in the famous 18th century book on magic entitled Grimorium Verum. For the purposes of this website, only those sections of On the Mysteries which deal with the Mystic Rites and Symbolism (Chapters 13, 14 and 15) are presented. I think, therefore, that all who delight in the spectacle of Theurgic reality will acknowledge this: that it is not proper to render to the gods partially or imperfectly the devotion which is rendered to them. Thus, therefore, before the gods make their appearance at the Rites, all the powers (potestates or daemons) that are subject to them, are set in motion; and when the gods are about to move toward the earth, they come ahead and go before them in procession. He, therefore, who does not bestow on all of them what he should, and address every one according to the honor to which he is entitled, is made to go away uninitiated and disappointed of the participation with the gods. But he who propitiates them all, bringing to every one the gifts in his power that are most suitable and acceptable, always remains safe and without blame, having well and most carefully accomplished the reception of the divine chorus. Since, therefore, this is the case, which of the two is proper: that the ceremonial of the Sacred Rite shall be simple and consisting of a few particulars, or elaborate and adapted to every move -- or, so to speak, as if from everything in the world mingled together? If, indeed, the power that is invoked and influenced by the Sacred Rite were simple and of one order alone, the ceremonial of the sacrifices would be of necessity also simple. But suppose the multitude of other powers (daemons and minor spiritual beings) that are aroused and set in motion at the descending of the gods can be included in no simple rite. The theurgists, from being experienced in the performances, are the only ones that know these things accurately, and they alone are able to cognize what constitutes the perfect celebration of the Sacred Ceremony. They are also aware that the omissions, though few, defeat the whole performance of the Sacred Rite, just as when in a harmony a single chord is broken, the whole becomes out of tune and discordant. As therefore, in the divine descents which are visible there occurs manifest injury to those who leave any of the superior beings unhonored, so likewise when they are present at the sacrifices unseen it is not well to honor one and not another, but instead every one should be honored according to the order to which he is allotted. He who leaves any of them without a gift holds the whole thing fast and destroys the one and entire arrangement. He does not, as some may therefore imagine, make the reception an imperfect one, but, on the other hand, he absolutely overturns the whole purpose of the Sacred Rite. What then? Does not the highest part of the Sacred Technic recur of itself to the One Supreme above the whole multitude of divinities, and yet at the same time worship in him the many essences and principalities? Certainly, I may be answered, but this takes place at a very late period, and only with the exceedingly few; and if it comes at the very sunset of life, they are content. Our present discussion, however, does not set forth the law for a man of such character, for he is superior to all law; but it establishes such a system of law for those who are in need of superior legislation. It says accordingly, that as the universe is a system from many orders combined into one, so it is proper that the complete ceremonial of the Sacred Rites, unceasing and entire, shall be joined with the whole category of the superior races. Certainly, indeed, if the cosmos is manifold and entire, and is constituted in many orders, it is proper accordingly that the Sacred Performance shall copy its various features, because of all the powers which they present to view. Hence, in relation to these and to the various kinds that are about us, it is not proper for us to be intimately connected with the divine causes (or beings) that are over them, from a part of the qualities in them. On the contrary, we should not aspire to be with their leaders, when anything on our part is omitted or incomplete. The diversified mode of celebrating the Holy Rite in the Sacred Performances, therefore, not only purifies us, but it also makes perfect something of the defects in us or about us, establishes in harmony and order, and otherwise delivers us from faults of deadly character. It likewise brings all into familiar relations with the races superior to us. And, certainly, when the divine causes and the human adaptations closely resembling them meet together to the same end, the initiation or Perfective Rite assures every full and ample benefit of the sacrifice. It will not be amiss, however, to add such particulars as the following in order to give an accurate understanding in respect to these things. The divinities of the highest order have always a superabundance of power, and while it is superior to all it is at the same time present with them all equally without impediment. In conformity with this statement, therefore, the very first illuminate the last, and those who are superior to matter are present with those belonging with matter, but not after the manner of the world of matter. Let no one be surprised even though we say that there is a certain matter that is pure and divine. For it originates from the Father and Demiurgos of the universe and possesses a completeness of its own suitable for a receptacle of gods. At the same time nothing obstructs the superior races from being able to illuminate the lower orders from their own substance. Nor does anything hold matter back from participating of the superior natures. So far as it is perfect, pure and evidently good it is not an unsuitable receptacle of the gods. For as it is necessary that the races in the earth shall be in no respect deprived of a divine participation, the earth also receives a divine portion from it, which is sufficient to admit the gods. The Theurgic discipline, therefore, recognizing these things and thus discovering in common with others the suitable receptacles of the gods according to the individual peculiarity of each, often joins together stones, plants, animals, and sacred aromatics, perfect and godlike, and afterward forms from all these a receptacle complete and pure. For it is not proper to be dissatisfied with everything material, but only with that which is repugnant to the gods. But that particular matter is to be chosen which is akin to them as capable of being in accord both in building the Houses of the gods, in the setting up of carved images, and, in fine, in the sacred ceremonial of sacrifices. For in no other manner can there be any participation in the receiving of the superior beings in places upon the earth or by human beings dwelling there unless such a beginning shall have been first established. We ought; then, to confide in the arcane declarations, that by means of the holy spectacles, a certain principle of matter is transmitted from the gods. This matter without doubt is of the same nature with the very ones themselves by whom it is given. Hence, does not the sacrificing of such a kind of matter arouse the gods to the visible manifestation, invite them to come quickly to our perception, and likewise receive them when they are present and cause them to unfold them-selves perfectly to view? The same things may also be learned from the assignment of the gods according to places, and from the division of authority over every particular thing, so far as they are assigned according to the different ranks, or the greater or lesser allotments. For this is certainly plain: that to the gods that are in large over particular places the things that are produced by them are the most, proper to be brought for sacrifice, and those that pertain to the governed are best suited for the divinities that govern. For to the makers their own works are most particularly gratifying, and to those who first of all introduce certain things such are acceptable above all else. If, on the other hand, certain animals, or plants, or other of the productions upon the earth, are under the rule of the superior races the divinities participate together in their superintendence and procure for us an inseparable union to themselves. Some of these things, therefore, being carefully saved and guarded, increase with the gods the intimate familiarity of those who hold them fast, inasmuch as by being kept inviolate they preserve in full force the communion of gods and men. Of such a character are some of the animals of Egypt, and in the same manner, the human being everywhere is sacred. Some of the consecrated victims, however, make the familiar relationship more conspicuous, so far as they affect the analysis in respect to the kindred and more sacred origin of the primitive elements with the Superior (divine) causes. This being accomplished, the benefits which are imparted from it are more perfect. If, then, these were human customs alone and so derived their authority through our institutions, it might be asserted that the Holy Rites of the gods were inventions of our own devising. Now, however, God, who is thus invoked in the sacrifices, is their author, and the gods and angels around him constitute a numerous throng. Under him, likewise, there is a public Overlord assigned by allotment to each nation upon the earth, and to every sanctuary its own. Of the sacrifices made to the gods, a god is director; of those to the angels, it is an angel; of those to the daemons, a daemon; and in like manner in other cases a superintendent is appointed over each in the manner consonant with the particular race. When, therefore, we bring our sacrifices to the gods, in company with the gods that superintend and make complete the mystic rites, it is our duty at the same time to revere the institution of sacred divine worship in regard to the Sacrifices. At the same time, however, it becomes us to be of good courage as we celebrate the holy rites under the ruling gods, and like-wise to exercise suitable caution, that we may not bring some gift unworthy of the gods, or obnoxious to them. In conclusion, then, we admonish at all events that the endeavor be made in respect to those around us, gods, angels and daemons, that are distributed according to race, in every part of the universe; and that an acceptable sacrifice shall be presented alike to them all. For only so can the Holy Rites be celebrated in a manner worthy of the divine beings that preside over them. A part of the Sacred Rites and not the least important is that of the prayers. They fill out the sacrifices to the fullest extent, and through these the entire performance becomes established and perfect. They likewise effect the general combined operation with the worship, and bring the Sacred Service into indissoluble copartnership with the gods. It will not be amiss to relate a few things in respect to this subject. For this very thing is of itself worthy to be learned, and it makes our superior perception in respect to the gods more perfect. I affirm, therefore, that the first ideal of prayer is a collecting (of our thoughts) and likewise a leading to contact and a genuine knowing of God. Next after this is the binding in communion with a single mind, and also the calling to us of the gifts which the gods have sent down, before the uttering of a word, completing the entire performances before it was perceived. But in the most perfect ideal which is the most perfect form of prayer, the occult union is sealed and its validity assured by the gods, procuring perfect repose in them for our souls. In these three limits in which everything divine is measured, prayer, making our friendship worthy of the gods, gives us the sacred aid from them three-fold. The first of these relates directly to illumination, the second to a general completion of effort, and the third to the complete fulfillment by means of the fire. At one time, prayer precedes the Sacred Rites; again it divides the Sacred Performance in the middle, and at another time, it further effects the purpose of the sacrifices. No sacred performance takes place properly, without the supplications in the prayers. But continual exercise in them nourishes our mind and spiritual nature, makes the reception-chambers of the soul vastly more spacious for the gods, opens the arcana of the gods to human beings, accustoms us to the irradiations of the Light, and by degrees perfects the qualities within us to a conjoining with the gods, bringing us back again to the very summit. It quietly draws upward our habits of thought and imparts to us the moral qualities of the gods. And besides this, persuasive discourse awakens a fellowship and affection that are indissoluble. It likewise augments the divine love and lights up the divine quality of the soul. It also cleanses away everything from the soul that is of a contrary character, and removes whatever about it is of æther-like and luminant spirit, so far as it is allied to the sphere of generated existence. It likewise makes perfect a good hope and confidence in respect to the Light, and, in short, brings to perfection those who are exercised in these disciplines, so that we may call them Companions of the gods. If this is what may be said of prayer, that it effects in us benefits of such importance, and likewise that it has a close relation to the sacrifices which we have mentioned, does not the object of the Sacred Rites thereby become clear, that it is a participating in intimate relations with the Creator? As then through the celebrating of the Rites, the benefit from it is as much as is conferred by the demiurgic divinities upon human beings. Indeed, from that source the exalting, the perfecting and completing influence of the prayers becomes manifest, how it becomes active, how unifying, and it has a common bond which is given from the gods. In the' third place, therefore, any one may easily perceive from what has been said, that the two (prayer and sacrifice) are established through each other and impart to each other the sacred power of the holy perfective rite. Hence there is manifest through all parts of the Sacerdotal System, the complete agreement and joint working with itself: the parts of it being more naturally connected than those of any animal, and joined together by one uninterrupted continuity of substance. Of this fact we ought never to be unmindful; nor should we accept half of it and reject the other half, but should be exercised in them all alike. It is necessary that they who desire genuinely to be conjoined with the gods should be initiated through the whole of them. These things, therefore, may not be otherwise. In regard to what remains to be considered, it is high time for me to pass on to the difficulty which you next suggest. "It is also required," you say, "that the Beholder must be pure from the contact of anything dead, and yet of the rites employed to bring the gods hither, many are made effective through dead animals." In order to reconcile these apparent contradictions we will take a survey of the conflict that seems to exist. There is no opposition at all in the case, but it only appears to be a contradiction in terms. For, indeed, if the law of the Rites commanded both that the dead bodies of the sacrifices should not be touched, and also that they should be touched, this would be contradictory to itself. But if it enjoins to keep aloof from those bodies that have not been consecrated, but permits to touch those that are purified, this is no contradiction. Further still, it is not allowable to handle the bodies of human beings after the soul has left them. For there is a certain trace, an eidôlon, or reflection of divine life which has been extinguished in the body by death. But it is not an unholy act to touch other animals that are dead, since they do not share the diviner life. It is, therefore, in the case of the other divinities, such as are not separate from matter, that abstinence from touching is essential, but in that of the gods that preside over animals and are intimately united to them, the invocation through animals in sacrifice is conceded. According to this view, therefore, there is no contradiction. This matter may also be explained in another way. For bodies deprived of life do bring defilement to human beings who are held by matter, because that which is not alive places a stain upon the living individual, like filth upon the clean, and one in a state of privation upon one in possession of a sufficiency, and also because it produces a taint through the natural aptitude to a worse condition by there being the power of dying. But the body produces no defilement upon a daemon, he being entirely incorporeal, and not receiving corruption from anywhere. On the other hand, it is necessary, for him to be superior to the corruptible body, and not to receive from it into himself any reflection of corruption. This much, therefore, I say in reference to the difficulty which you suggest in regard to the contradiction. While explaining by itself how divination is performed by means of the sacred animals, as, for example, by hawks, we did not assert in any manner that by the employment of bodies thus brought into affinity, the gods were present. For they are not set over animals singly, either by assignment, or by any relation to the realm of matter. But to the daemons, and especially to those that are apportioned to the realm of matter, such dealing with the agencies of divination may be assigned, different animals being allotted to different ones, and such ascendancy having been established through contiguity, and they not having been assigned by lot to their respective dominion, by lot are entirely independent and clear of the realm of matter. Or, if any one desires it to be set forth, a seat or vehicle may be assigned to them of such a character by means of which they may be enabled to hold converse and give responses to human beings. We must think, then, that this vehicle is pure from contamination of bodies; for no communion whatever exists between that which is pure and the contrary, but there is a reason for it to be conjoined with human beings through the soul of animals. For this soul has a nature kindred to human beings, through a like vital principle; and likewise to daemons, because being free from bodies it after a manner exists separately. But as it is intermediate between both, it is subservient to the controlling daemon, yet it makes known to those who are still withheld in the body whatever the overlord directs. Thus a common bond of union is given between them, each to the other. It ought to be borne in mind, however, that the soul that makes use of such methods of divination, not only becomes a hearer of the oracle, but it also contributes from itself, to no small degree, a certain fatality for the accomplishing of it in respect to the performances. For through a certain sympathy of necessity, they are moved together, and act and prognosticate together. Hence such a mode of divining as this is entirely different from the mode that is divine and genuine; being able to give oracles in relation to trivial and every-day matters -- such as pertain to the diversified realm of nature, and are now brought into relation to generated existence. They likewise, impart activities from themselves to those capable of receiving them and produce emotional conditions of many kinds in those who are naturally susceptible to being affected in concert. But the perfect faculty of foreknowing is never developed by emotional excitement. For that which is most of all the unchangeable, and likewise the exempt from matter and in every way pure, attains readily to a perception of the future; but that which is commingled with the irrationality and darkness of the corporeal and materialistic nature, is filled with dense ignorance. Hence, it is never well to receive any such ingenious procedure in divination. Nor ought we to make use of it with any considerable eagerness, nor to trust another person that does it, as though it possessed of itself any clear and well-known evidence of truth. This is enough for us to say in relation to this kind of divining. Come, then, let us discourse about difficulties of another class, that are in the category of occult things, and which contain, as you say, "threats of violence." In regard to the multitude of threats, the accusation is divided into many parts. For the actor threatens that he will either "assail the sky, reveal to view the arcana of Isis, expose to public gaze the ineffable symbol in Abydos, to stop the Baris, scatter the limbs of Osiris like Typhon, or do something else of a similar character." The men do not, as you imagine, hold out this form of words as a threat "to the Sun-god, or to the Moon, or any of the divine ones in the sky"; for then there would occur more fearful monstrosities than those of which you angrily complain. On the other hand, as I said before in these explanations, there is in the divisions of the world a class of powers, incapable of judgment, and unreasoning. It receives and obeys a word of command from another, but it neither makes use of intelligence of its own, nor distinguishes the true and the false, or the possible or impossible. Such a race of beings, when threats are held over them incessantly, are thrown into agitation and filled with amazement. Hence, I think that it is natural for this class to be led by forcible utterances, and to attract other things by means of senseless and unstable phantasy. These things have also another explanation, as follows: The theurgic priest, through the power of the ineffable emblems, commands the cosmic spirits, not as a human being, nor as making use of a human soul. On the other hand, as one preexisting in the order of the gods, he makes use of threats more terrible than he could make from his own being alone. This is not as though he was about to do everything which he confidently affirms, but he teaches by such use of words how much, how great and what power he has through being at one with the gods. This power the knowledge of the ineffable symbols imparts to him. This also can be said: That the daemons who are distributed by departments, and who are guardians over the departments of the universe, have charge and superintendence individually of the departments to which they were allotted; so that they do not even admit a word to the contrary, but preserve the perpetual continuance of things in the world without change. They assume this unchangeableness, because the order of the gods remains immovably the same. Hence, they do not endure even to a hearing, that this shall be threatened in which the daemons of the atmosphere and those of the earth have their being. The subject may also be explained as follows: The daemons have the guardianship of the Ineffable Mysteries. Thus, therefore, I assure you they maintain to a superior degree the orderly arrangement everywhere. For through this the constituent parts of the universe remain in their order because the beneficent power of Osiris continues pure and immaculate, and is not at all commingled with the opposing vice and disorder. The life of all things also remains pure and uncorrupt because the occult life-producing beauties of the rational faculties of Isis do not descend into the body, which is manifest and visible to the senses. But all things remain immutable and ever-coming into existence, because the course of the sun is never stopped. All things likewise remain perfect and entire because the ineffable arcane in Abydos (or in the inner shrine) are never at any time revealed to profane contemplation. Hence in these conditions, in which consists the safety of all things, I say, in the ineffable symbols being preserved occult and in the unutterable essence of the gods never being repressed by the contrary allotment -- this is not endurable even by sound for the daemons to listen to that belong around the earth, namely: that they are diverse in quality, or are unhallowed beings, and that on this account such a style of [threatening] words has a certain appropriateness to them. No one, however, utters a threat to the gods, nor is any such mode of prayer addressed to them. Accordingly with the Chaldaeans, with whom there has been a pure language set apart for the gods alone, a threat is never uttered. The Egyptian priests, however, having intermingled at the same time the divine symbolic terms and the daemonian words, make use, when it is proper, of threats. Thou hast now the answer in relation to these difficulties; concise, indeed, but I think sufficiently clearing away every one of them. Those difficulties require for solution the same divinely wise Muse. I desire, beforehand, however, to interpret to thee the peculiar form of the theological system of the Egyptians. For they, endeavoring to represent the productive principle of the universe and the creative function of the gods, exhibit certain images as symbols of mystic, occult and invisible conceptions, in a similar manner as of Nature (the productive principle), in her peculiar way, makes a likeness of invisible principles through symbols in visible forms. But the creative energy of the gods delineates the genuine reality of the forms through the visible images. 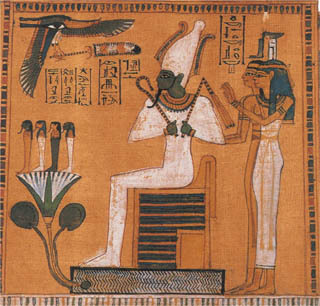 The Egyptian priests, therefore, perceiving that all the superior races are gratified at the resemblances of the inferior tribes to themselves, and desiring to supply the latter with benefits through such representations, so far as possible, do themselves bring into use for them as may be expected, a mode of initiation into the mysteries which is appropriately concealed in the symbols. Listen, therefore, to the spiritual interpretation of the symbols, according to the conception of the Egyptian priests, dismissing from thy imagination and hearing the phantom-likeness of the symbols themselves, and bringing thyself upward to the spiritual reality. By "ilus" or slime, then, recognize everything of a corporeal nature or belonging to the realm of matter, or that is nourishing and procreative, or such as is a material form belonging to the realm of nature and borne along with the never-still currents of the realm of matter, or such as the river of generative existence contains and which sinks with it, or the originating cause of the elements and of all the powers relating to the elements, which subsisted before in correspondence to a foundation. It being of such a quality, God, who is author of all generation and production, and of all elemental forces, as being superior to them, immaterial and incorporeal, exalted above the realm of nature and likewise begotten and undivided, entire of himself and concealed in himself, is supreme above all these and embraces them all in himself. And because he contains everything and gives himself to all the universe, he is made-manifest out from them. Because he is superior to the universe, he is spread out over it by himself, and is manifested as separate, removed, high in the air and unfolded by himself above the forces and elementary principles in the world. The following symbol likewise attests this: For the one "sitting above the lotus-blossom" expresses enigmatically an exaltation above the slime, and likewise denotes spiritual and empyrial supremacy. For everything pertaining to the lotos, both the forms in the leaves and the appearance of the seed, is observed to be circular. This very energy is akin to the unique circle-like motion of the mind, manifesting it in like manner according to the same forms, in a single arrangement, and according to one principle. The god himself, however, is seated alone, above any such dominion or energy, august and holy, filled abundantly, and remaining in himself without change, as the figure of one sitting is intended to signify. The one "sailing in a Boat" sets before the mind the power that directs the world. As, therefore, the Pilot, being apart from the ship, has the control of its rudders, so the Sun subsisting separately has control of the helms of all the world. And as the pilot from above at the stern, giving forth from himself the first brief beginning of the course, directs everything, so by an infinite priority of rank, the God from above, imparts without division from the first principles of Nature, the first-operative causes of motions. These things, therefore, and still more than these, are denoted by One Sailing in a boat. Every department of the sky, every sign of the zodiac, every celestial course, every period of time according to which the world is put in motion, and all perfect things receive the forces which go forth from the Sun. Some of these forces are closely interblended with these, but others are superior to any commingling with them. Accordingly, the symbolic mode of expression also suggests them: "Assuming a shape according to the Signs of the Zodiac and changing forms according to the Season." It likewise manifests his unchangeable, constant, unceasing and generally universal and abundant giving to the whole world. The different receivers, however, are variously affected with regard to the indivisible boon of the divinity, and they receive from the Sun powers of many kinds according to their peculiar impulses. In this way the series of symbols coming in succession, is designed, through the multitude of gifts, to make manifest the One God [the Sun], and through the manifold powers exhibited, to cause his one power to appear. Hence, also, it sets forth that he is One and the Same, but that the changes of shape and the transformations are taken for granted among the recipients. On this account it is affirmed that the Sun changes "according to the sign of the zodiac and according to the season," because these manifestations are diversified with respect to the god, according to the many forms of his reception. The Egyptian priests make use of such prayers to the Sun, not only at the Autopsias, but also in the more public prayers which have an interior sense, and are offered to the divinity with reference to such a symbolic initiation into Mysteries. Hence it is not permitted that anyone shall offer any explanation. But the enquiries which follow, if we are to go through with them sufficiently in detail, require more information. Yet it is equally necessary in replying to bring out the truth in relation to them in few words. Thou demandest: "Why are terms preferred that are unintelligible?" They are not "unintelligible," however, as thou hast thought. Nevertheless, let them be unknown to us, or let some of them be known, with reference to which we receive solutions from the gods; they, certainly, are all of them significant to the gods in a manner not divulged. Nor can they be significant and also oracular with human beings through imaginings, but either spiritually by the mind which is at once divine and human, or in silence, or to express the conception in a better and simpler manner, by a mind united with the gods. We should, therefore, set aside all conceits and logical quibbles in regard to the divine names, and should, likewise, pay no attention to natural resemblances of speech which are closely akin to objects in the realm of nature. In the same manner, then, as the symbolic token of the divine likeness is spiritual and divine, the same thing is to be taken for granted in the names. Indeed, although we may not know it, this very thing is the most august in the case, for it is too grand to be classified for the purpose of being made known. In regard to those, however, of which we have received the skill to interpret the meaning, we possess in the name, the knowledge of the divine essence, power and order. Moreover, we guard care-fully in the soul the mystic and ineffable image of the gods; and through this we lead the soul upward to the gods, and having exalted it as far as possible, we ally it with the gods. But you ask, "Why of names that are significant, do we place foreign ones before those of our own language?" The reason for this, also, is connected with the Mystic Rites. For the gods have made known that of the Sacred Nations, like the Egyptians and likewise the Assyrians, the entire dialect is suitable for sacred places. Hence, we believe that we ought to address our communications in speech native to the gods; and because such a mode of speaking is primitive and ancient, and most of all, as those who learned the first terms relating to the gods, mingled them with their own language and transmitted it to us, as being proper and suitable for these things, we have always preserved the law of tradition till the present time inviolate. For whatever else pertains to the gods, plainly the everlasting and unchangeable is kindred to them. It is then objected: "If the one who hears the voice gives attention to the signification, it is enough that the concept remains the same, whatever the term may be." The fact, however, is not as thou imaginest. For if terms had been fixed by conventional agreement, it would make no difference if some should be used instead of others. But if they are closely allied together in the nature of the things that have being, those the more like it will be most assuredly the more agreeable to the gods. From this fact it appears agreeable to reason that the language of the sacred nations has been adopted in preference to that of the rest of mankind. For terms when they are translated do not always preserve their meaning the same as before; and besides, there are certain idioms with every nation that are impossible to express to another in intelligible speech. Accordingly, though, it may be possible to translate them; they no longer preserve the same force. "Foreign terms," likewise, have great emphasis and much conciseness, and contain less ambiguity, diversity and varied shades of meaning. For all these reasons they suit the Superior Races. Away, then, with conjectures which deviate from the truth: such as this, whether "the divinity that is invoked is Egyptian in race or makes use of the Egyptian language." Understand instead that the Egyptians were the first of mankind that were allotted to communion with the gods; and the gods that are invoked delight in the Egyptian customs. Suppose, then, "these are all of them artful contrivances of jugglers," how is it possible that these things without which no sacred performance takes place successfully, which in the highest degree conjoin us with the gods, and combine us with them, and which possess powers almost equal to those of the superior races, should be only figments of the imagination? On the other hand, is it not true that "these are disguises that have their origin in the passive conditions about us through being attributed to the divine agency?" For it is not from what we have experienced, but on the contrary, from what are peculiar attributes of the gods, that we are aroused and ad-dress to them naturally the expressions proper for them. Nor do we form "conceptions of the divine nature contrary to what it actually is." On the other hand, wherein it is natural, and as they who first established the laws of holy religious worship have come upon the truth respecting it, so we continue in them. For if anything of different customs of a religious character harmonizes with them, it is what does not change. And it is necessary with the ancient prayers as with the sacred places of asylum to preserve them inviolate and in the same manner, neither taking anything from them nor adding anything to them from any other source. For this is perhaps the reason why at the present time everything is going to decay, and both the occult terms and the prayers have become without efficiency. They are constantly undergoing changes through the innovating disposition and the lawlessness of the Greeks, and nothing remains as it was. For the Greeks are by nature fond of innovation, and they are carried onward rushing eagerly in every direction. They have no ballast in them and they do not preserve what they received from anybody; but letting it quickly go, they remodel everything according to a never-ceasing fluency of words. But the foreign priests are steadfast in their customs, and continue firmly with the same words; for which reason, making use of the words grateful to them, they are themselves beloved by the gods. Nevertheless, to change them in any way is not lawful for any human being. This much we have answered thee in regard to the words which are called both unutterable and barbarous or foreign, and yet are becoming in holy rites.